Secretary of the Army Mark T. Esper signed a directive Jan. 23 that increases parental leave from 10 to 21 days for soldiers who are designated secondary caregivers of infants. 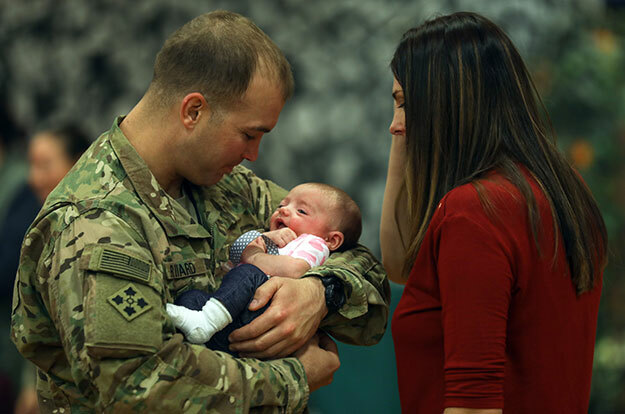 The new policy makes the Army's parental leave comparable to that of other services and in compliance with the 2017 National Defense Authorization Act. Mothers will now be granted six weeks of convalescent leave directly after giving birth and can be granted another six weeks of leave as primary caregiver to bond with their infant anytime up to a year after birth. "We want soldiers and their families to take full advantage of this benefit," said retired Col. Larry Lock, chief of Compensation and Entitlements, Army G-1. He said parental leave is a readiness issue that ensures mothers have the time they need to get back in shape while it also takes care of families. The new policy is retroactive to Dec. 23, 2016 - the date the NDAA legislation was signed for fiscal year 2017. In other words, soldiers who took only 10 days of paternal leave over the past couple of years can apply to take an additional 11 days of "uncredited" leave as a secondary caregiver. An alternative would be to reinstate 11 days of annual leave if that time was spent with their infant. Eligible soldiers need to complete a Department of the Army Form 4187 and submit it to their commanders for consideration regarding the retroactive parental leave. Fathers can also be designated as primary caregivers and granted six weeks or 42 days of parental leave, according to the new policy. However, only one parent can be designated as primary caregiver, Lock pointed out. If a mother needs to return to work and cannot take the six weeks of leave to care for an infant, then the father could be designated as primary caregiver, he said. However, if the mother has already taken 12 weeks of maternal leave, that option is not available. Until now, mothers could receive up to 12 weeks of maternity leave, which had to be taken immediately following childbirth. Now, only the six weeks of convalescent leave needs to be taken following discharge from the hospital. The second six weeks of primary caregiver leave can be taken anytime up to a year from giving birth, but must be taken in one block. In the case of retroactive primary caregiver leave, it can be taken up to 18 months from a birth. This provides soldiers more flexibility, Lock said. The new directive applies to soldiers on active-duty, including those performing Active Guard and Reserve duty as AGRs or full-time National Guard duty for a period in excess of 12 months. Summing up the new policy, Lock said the Military Parental Leave Program, or MPLP, now offers three separate types of parental leave: maternity convalescent leave, primary caregiver leave, and secondary caregiver leave. Mothers who decide to be secondary caregivers are eligible for the convalescent leave and the 21 days for a total of up to nine weeks. Parents who adopt are also eligible for the primary or secondary caregiver leave. The new policy is explained in Army Directive 2019-05, which is in effect until an updated Army Regulation 600-8-10 is issued.